Background/aims Intestinal permeability with systemic distribution of bacterial products are central in the immunopathogenesis of alcoholic liver disease (ALD), yet links with intestinal immunity remain elusive. Mucosa-associated invariant T cells (MAIT) are found in liver, blood and intestinal mucosa and are a key component of antibacterial host defences. Their role in ALD is unknown. Methods/design We analysed frequency, phenotype, transcriptional regulation and function of blood MAIT cells in severe alcoholic hepatitis (SAH), alcohol-related cirrhosis (ARC) and healthy controls (HC). We also examined direct impact of ethanol, bacterial products from faecal extracts and antigenic hyperstimulation on MAIT cell functionality. Presence of MAIT cells in colon and liver was assessed by quantitative PCR and immunohistochemistry/gene expression respectively. Results In ARC and SAH, blood MAIT cells were dramatically depleted, hyperactivated and displayed defective antibacterial cytokine/cytotoxic responses. These correlated with suppression of lineage-specific transcription factors and hyperexpression of homing receptors in the liver with intrahepatic preservation of MAIT cells in ALD. These alterations were stronger in SAH, where surrogate markers of bacterial infection and microbial translocation were higher than ARC. Ethanol exposure in vitro, in vivo alcohol withdrawal and treatment with Escherichia coli had no effect on MAIT cell frequencies, whereas exposure to faecal bacteria/antigens induced functional impairments comparable with blood MAIT cells from ALD and significant MAIT cell depletion, which was not observed in other T cell compartments. Conclusions In ALD, the antibacterial potency of MAIT cells is compromised as a consequence of contact with microbial products and microbiota, suggesting that the ‘leaky’ gut observed in ALD drives MAIT cell dysfunction and susceptibility to infection in these patients. One of the major and most common complications that patients with alcohol-related liver disease (ALD) face is an increased susceptibility to infection, which can lead to worsening of liver disease and multiorgan failure. Indeed, the inability to contend with bacterial infection is associated with a four-fold increase in mortality, and once the infection is established 30% of these patients will die within 1 month and a further 30% by 1 year. To date, we have limited understanding regarding the processes that mediate this immune impairment. Recently, a new subset of innate T cells, known as mucosa-associated invariant T cells (MAIT), have been described as a key component in the arsenal of antibacterial host defences. These are unconventional T cells that respond to bacteria-derived metabolites and are found in large numbers in the liver, intestinal mucosa and peripheral blood. They represent a fundamental sentinel system for the homeostatic control of the gut flora and exert essential roles for the control of bacterial infections. Given that these cells defend the host at key locations associated with alcoholic liver disease, such as the gut and the liver, it is likely that they are intimately involved in the susceptibility to infection observed in patients with ALD. This study is the first report comprehensively describing their role in the defective antibacterial immunity in ALD, which was previously unknown. A broad spectrum of dramatic quantitative and functional impairments of blood MAIT cells exist in patients with alcohol-related cirrhosis, which is exacerbated in those with severe alcoholic hepatitis possibly signifying an association with disease severity. The majority of blood MAIT cells in patients with ALD are deleted and the remaining population exists in a state of ‘poised’ activation, displaying increased expression of activation markers, but lack of lineage-specific transcription factors and significantly compromised antibacterial cytokine and cytotoxic responses. Loss of gut integrity and the increased translocation of gut bacteria, bacterial antigens and metabolic products drive selective MAIT cell depletion and dysfunction resulting in highly compromised antibacterial defence systemically. Intrahepatic MAIT cells in ALD are numerically preserved with preferential portal accumulation, despite a significant deficit in blood MAIT cell frequencies, suggesting a key role as biliary firewall protecting the epithelial lining from translocated bacteria. The most common cause of death in patients with alcohol-related liver cirrhosis is the development of serious bacterial infections as a consequence of impaired host immune defences. Current guidelines recommend intensive and early antibiotic therapy in these patients. However, this has led to the increasing emergence of multidrug-resistant bacteria. These infections are associated with a higher incidence of septic shock and/or rapid deterioration of liver function and death. As such, there is a pressing need to explore new paradigms for anti-infective therapy, and we believe that host-directed immunomodulatory therapies are a promising approach. The findings from this report highlight MAIT cells as a potential therapeutic target to restore immune competency in ALD. Strategies aimed at restoring the gut barrier, at functional reprogramming of MAIT cells or the use of MAIT cells derived from induced pluripotent stem cells (iPSC-derived MAIT cells) may represent novel attractive immunotherapeutic avenues to allow reconstitution of antibacterial immunity. Given that MAIT cells defend the host at key locations associated with alcohol-induced liver injury, namely the gut and the liver, we hypothesised that they may play an important role in the immunopathogenesis of ALD. The study was performed conforming to the Declaration of Helsinki, with full informed patients’ consent and individual ethical approval from all recruiting centres (online supplementary methods). SAH (n=13): with Maddrey’s discriminant function ≥32,25 excluding patients receiving immunosuppressants prior to/at the time of sampling. ARC (n=9): excess alcohol drinkers (>80 g/day/male, >60 g/day/female) with compensated disease (Child-Pugh A/B) seen as outpatients, excluding patients with >4 weeks abstinence, cancer, GI bleeding, untreated sepsis or immunomodulatory treatments. Healthy controls (HCs; n=13): non-smoking healthy volunteers. In addition, long-term excess alcohol users undergoing monitored short-term alcohol withdrawal (n=35, paired) were tested at baseline (still drinking) and after 2–5 days of abstinence. Subjects were recruited from the Salvation Army alcohol rehabilitation centre based on Drug and Alcohol Action Team (DAAT) referrals, with exclusion of patients with documented severe mental disorders (DAAT documents, Salvation Army screening and nursing team interviews) and/or unable to give informed consent. Of these 35 patients, five had liver stiffness (measured by FibroScan ‘E’ parameter) above threshold for cirrhosis (≥12), while 20 had liver stiffness <7. B. To investigate the impact of faecal extracts on MAIT cells: stool samples were collected from 27 patients with ALD (SAH: n=7; ARC: n=20) and 12 HCs. C. To measure MAIT cell frequencies in colon and liver tissue: colon pinch biopsies were obtained from 11 ARC and 10 HCs colon resections; liver biopsies were obtained from explanted livers of five ARC and five healthy liver donors. Table 1 summarises all patients’ characteristics. Surrogate markers of bacterial infection and intestinal translocation27 were measured with the Limulus-amebocyte-lysate assay (Pierce/Thermo Fisher Scientific, Paisley, UK) and a colorimetric D-lactate assay (AbCam, Cambridge, UK) respectively. Stocks of E. coli DH5α were grown in RPMI 1640 medium (Gibco/Thermo Fisher Scientific), fixed in BD Cytofix buffer (formaldehyde 4% in PBS, BD Biosciences, Oxford, UK) (10 min, room temperature (RT)), extensively washed in PBS (Gibco/Thermo Fisher Scientific) and preserved at 4°C–8°C (or −80°C for long-term storage). Stool samples from patients with ALD and HC were homogenised in PBS. Suspensions were clarified with five rounds of centrifugation at increasing speed (1000–1500 rcf) and duration (1–5 min) to discard debris pellets. Clarified faecal extracts were pelleted, fixed and preserved following the same protocol used for E. coli. All bacterial concentrations were determined by visual counting with a Neubauer-Petroff chamber. Cryopreserved PBMCs were defrosted, counted and used for flow cytometry directly or after overnight culture (37°C, 5% CO2) in round-bottom 96-well plates (300 000/200 µL/well) in RPMI 1640 medium, 10% pooled heat-inactivated human AB serum (Sigma-Aldrich), 100 IU/mL penicillin/streptomycin, 2.2 mmol/L l-Glutamine, 23 mmol/L HEPES (all from Gibco/Thermo Fisher Scientific). Cell recovery and viability were always greater than 90%. Cells were unstimulated or stimulated overnight with fixed E. coli (100 bacteria per cell (BpC)). One hour before adding E. coli, some cultures were (1) preblocked with polyclonal blocking antibody anti-PD1 (10 µg/mL, AF1086, BioTechne/R&D Systems, Abingdon, UK); (2) preincubated with ARC/SAH plasma (10%); (3) pretreated with increasing concentrations of ethanol (50–100–250 mmol/L); or (4) preincubated with ARC/SAH/HC faecal extracts (FEB, 100 BpC). Brefeldin A (Sigma-Aldrich) was added to cultures used for intracellular flow cytometry 1 hour after E. coli (10 µg/mL). MAIT cells were identified by flow cytometry using the following panel: CD3/CD4/CD8/TCR_Vα7.2/CD161. We measured (1) activation markers and immune checkpoint receptors (CD69/HLA-DR/PD1/TIM3/LAG3); (2) intracellular cytokines/cytotoxicity markers (IFNγ/TNFα/IL-17/GranzymeB/Perforin/CD107a); (3) homing-related markers (beta7-integrin/CCR9/CXCR3/CX3CR1/CD26); (4) cytokine receptors (IL-7R/IL-18R); (5) proliferation/senescence markers (Ki67/CD57); and (6) transcription factors (RORγt/PLZF/Eomes/T-bet). The impact of stool on MAIT cell caspase-dependent apoptosis was assessed by exposing healthy PBMC cultures with FEB (as described above) and measuring apoptosis rates using the Vybrant-FAM Poly-Caspase kit (Thermo Fisher Scientific) following the manufacturer’s instructions. Online supplementary methods and online supplementary table 1 describe the detailed staining procedure and list all the antibodies used. Samples were acquired and analysed on a FACSCanto-II (BD Biosciences). Levels of expression of all markers of interest were measured both as percentage (%) of positive cells and as median fluorescence intensity (MFI). RNA from PBMC and colon pinch biopsies was extracted in TriReagent (Ambion/Thermo Fisher Scientific) and chloroform (Sigma-Aldrich) (15 min, RT) followed by isopropanol precipitation (Sigma-Aldrich) (10 min, RT), washed with ethanol (Sigma-Aldrich) 75% in RNAse-free water (Ambion/Thermo Fisher Scientific), resuspended in RNAse-free water and stored at −80°C. RNA was quantified by NanoDrop spectrophotometry (Thermo Fisher Scientific). cDNA was transcribed with QuantiTect Reverse Transcription kits (Qiagen, Manchester, UK). Real-time TaqMan PCR was performed on an ABI 7500 system (Applied Biosystems/Thermo Fisher Scientific) using previously published primers and probe.28 29 Online supplementary methods describe the detailed TaqMan PCR protocol. Public microarray datasets (Gene Expression Omnibus dataset GDS4389, series GSE28619)30 were interrogated to measure selected genes of interest in liver tissue from SAH (n=15) and healthy controls (n=7). See online supplementary table 2 for the lists of all queried/analysed genes. Immunohistochemistry was performed as previously reported.8 In brief, cubes of liver tissue (1–1.5 cm3) were cut, snap frozen in liquid nitrogen and stored at −80°C. Tissue was then embedded in Cryoembed (Leica Biosystems, Newcastle upon Tyne, UK). Seven micrometre thick sections were cut using a cryostat (specimen temperature: −13°C; chamber: −20°C) and stained with purified primary antibody anti-TCR_Vα7.2 (clone 3C10, BioLegend, London, UK) or IgG1-isotype-control (1 hour, both at 50 µg/mL in PBS) followed by Impress secondary reagent (Vector Laboratories, Peterborough, UK) (30 min, RT). Parenchyma and portal tracts were imaged on a Zeiss Axioskop 40 Microscope with 20–40× magnifications and measured using AxioVision SE64 V.4.9. Numbers of TCR_Vα7.2(+) cells/mm2 were counted. Online supplementary methods describe the detailed staining procedure. Sample size/power calculations (alpha=0.05, beta=0.20) indicated that the numbers of patients used for the main analyses were sufficient to evaluate the main differences. Statistical significance and family-wise alpha for multiple comparisons were set at p=0.05. We used (1) Mann-Whitney and Kruskal-Wallis tests with Dunn’s multiple comparisons correction for independent samples; (2) paired Wilcoxon test for paired samples; (3) χ2 test for categorical variables; and (4) Spearman’s rho (ρ) or Pearson’s r coefficients for correlations as appropriate. E. coli stimulation or pretreatment with patient plasma/ethanol/faecal extracts were evaluated by absolute delta change or fold change versus unstimulated or untreated samples as appropriate. Statistics were calculated with Microsoft Excel, SPSS V.21 and GraphPad Prism. All baseline clinical characteristics are summarised in table 1. As expected, SAH patients were significantly sicker than ARC and had greater propensity to bacterial infection within 1 year of recruitment (OR 2.92, 95% CI 0.41 to 20.90): approximately half of SAH developed bacterial infection (5/11) compared with only a fifth of ARC (2/9). One-third of patients with SAH died within 6 months of recruitment, whereas no ARC patients died during the study period. MAIT cells were identified as TCR_Vα7.2(+)/CD161(hi) within the CD8 T cell population11 (figure 1A). Blood MAIT cells were significantly reduced in ARC patients compared with controls (p=0.013) and even more dramatically in SAH (p<0.0001) (figure 1B). Interestingly, other TCR_Vα7.2(+) T cells28 were not depleted, and there was no proportional increase of CD161(−) CD8 T cells, suggesting this effect was specific to MAIT cells and not due to CD161 downregulation (figure 1C). Blood MAIT cell depletion in patients with ALD. (A) Gating strategy to identify MAIT cells by FACS. (B) Blood MAIT cell frequencies in controls (n=13), ARC (n=9) and SAH (n=13) patients. (C) MAIT cell depletion is selective, as TCR_Vα7.2(+) GEM cells and TCR_Vα7.2(+)/CD161(−) are unchanged (counts as above). (D) No MAIT cell depletion in healthy PBMC treated with control/ALD plasma (ARC: n=5; SAH: n=5) or blood MAIT cells from controls (n=9), ARC (n=9) and SAH (n=9) stimulated with high bacterial load. (E) Lack of MAIT cell depletion upon in vitro ethanol treatment of healthy PBMC. ALD, alcohol-related liver disease; ARC, alcohol-related cirrhosis; FACS, flow cytometry; GEM, germline-encoded mycolyl lipid-reactive T cells; MAIT, mucosa-associated invariant T cells; PBMC, peripheral blood mononuclear cells; SAH, severe alcoholic hepatitis. To investigate the mechanisms inducing MAIT cell depletion in ALD, we cultured control/ALD PBMC with fixed E. coli (100 BpC) and also control PBMC with ALD/control plasma; ALD plasma contained significantly higher levels of bacterial products than controls (online supplementary figure 1). We found that none of these challenges induced MAIT cell deletion (figure 1D). We did, however, identify a trend for an association between increasing plasma levels of D-lactate (a surrogate marker of gut permeability and intestinal translocation) and reduced blood MAIT cell frequencies in patients with ALD overall (online supplementary figure 1). Additionally, exposing control PBMC to ethanol in vitro (50–100–250 mmol/L) had no direct MAIT cell toxicity (figure 1E), and ethanol withdrawal in vivo did not induce quantitative MAIT cell recovery in excess alcohol users undergoing short-term abstinence (online supplementary figure 2). We hypothesised that the observed depletion of blood MAIT cells may be due to liver relocation and to assess this we evaluated the expression of liver homing markers on blood MAIT cells and intrahepatically. We found comparable expression of these markers (total beta7-integrin, CXCR3, CCR9 and CX3CR1) on blood MAIT cells between ALD and controls, and blood MAIT cells from all groups always expressed high levels of IL-7R, IL-18R and CD26/DPP4 as expected13 31 (online supplementary figure 3). Conversely, microarray data revealed that intrahepatic alpha4/alphaE integrins (individual beta7-integrins, p<0.02) and also T cell chemoattractant CXCL10 (CXCR3-ligand, p<0.001) were hyperexpressed in SAH liver tissue compared with controls (figure 2A). Notably, MR1 expression, inducible upon bacterial exposure and relevant to MAIT cell engagement and killing of infected MR1-expressing cells, was also considerably stronger in SAH liver tissue (p<0.002) (figure 2B). Taken together these data reveal that there are homing signals in the liver that may facilitate intrahepatic MAIT cell relocation or retention in ALD. 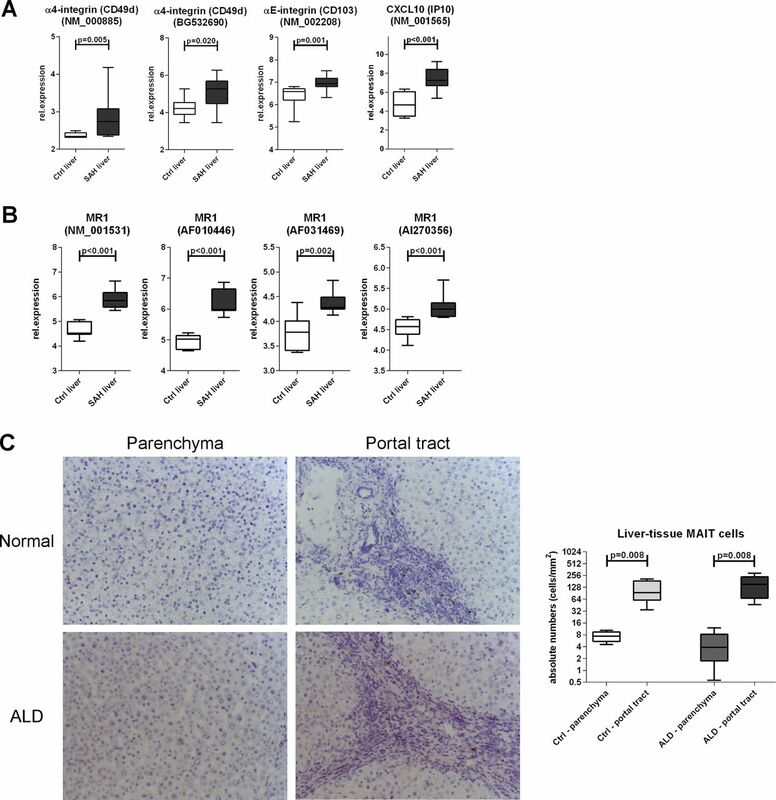 Preservation of MAIT cells in the liver in ALD. Intrahepatic hyperexpression of homing markers (A) and MR1 (B) within total liver tissue, public microarray dataset analysis (Ctrl: n=7; SAH: n=15). (C) Liver parenchymal and portal TCR_Vα7.2 (clone 3C10) immunohistochemistry to identify intrahepatic TCR_Vα7.2(+) cells; fresh-frozen biopsies from ALD livers (n=5) and healthy liver donors (n=5). ALD, alcohol-related liver disease; MAIT, mucosa-associated invariant T cells; MR1, MHC-related molecule 1; SAH, severe alcoholic hepatitis. We then enumerated TCR_Vα7.2(+) cells in fresh-frozen liver sections from ARC and healthy liver donors and in colon pinch biopsies from ARC patients and controls. Absolute numbers of intrahepatic TCR_Vα7.2(+) cells in liver parenchymal or portal regions were comparable between patients and controls, with similar greater portal accumulation in both groups (p=0.008) (figure 2c). TaqMan PCR failed to detect TCR_Vα7.2/TRAV1-2 transcripts in colon pinch biopsies (but not in PBMC, used as a positive control) (data not shown), suggesting that MAIT cells may distribute preferentially in locations other than the colonic mucosa. These data show that MAIT cells are not deleted in the liver of patients with ALD, although being dramatically depleted in their peripheral blood. Compounding their significant depletion in the systemic circulation, the remaining population of blood MAIT cells in patients with ALD had a marked hyperexpression of canonical activation markers (CD69: p<0.008; HLA-DR: p<0.03) (figure 3A). A comparable hyperactivated status was induced by treating control PBMC with ALD plasma (p<0.008) (figure 3B), but not with increasing concentrations of ethanol in vitro (figure 3C). CD69 can suppress T cell functions through binding with its putative ligand Galectin 1 (Gal1),32–34 and we found that Gal1 expression was stronger in SAH liver tissue than controls (p<0.001) (figure 3D), suggesting greater ability of CD69-mediated intrahepatic MAIT cell inhibition in these patients. Blood MAIT cells in ALD display a hyperactivated phenotype. (A) CD69/HLA-DR hyperexpression by ALD blood MAIT cells compared with controls (n=9 for all groups). (B) ALD plasma (ARC plasma: n=5; SAH plasma: n=5) can increase CD69/HLA-DR expression in healthy PBMC compared with control plasma. (C) MAIT cell activation status is not induced by in vitro ethanol treatment of healthy PBMC. (D) Gal1 expression is increased in SAH liver tissue (control: n=7; SAH: n=15), public microarray dataset analysis. (E) Immunoinhibitory checkpoints are not upregulated on hyperactivated blood MAIT cells in ALD (n=9 for all groups). (F) Comparable levels of cell proliferation/senescence markers (Ki67/CD57) between groups (n=5 for all groups). ALD, alcohol-related liver disease; ARC, alcohol-related cirrhosis; Gal1, Galectin 1; MAIT, mucosa-associated invariant T cells; PBMC, peripheral blood mononuclear cells; SAH, severe alcoholic hepatitis. We then assessed whether MAIT cells exhibited signs of exhaustion and immune senescence and found no evidence of this phenotype in ALD: expression of immune checkpoint receptors (PD1/TIM3/LAG3) on blood MAIT cells was comparable in patients and controls (figure 3E); culture of MAIT cells with anti-PD1 antibodies did not modulate MAIT cell phenotype or function (data not shown); furthermore, proliferation or senescence markers (Ki67/CD57) were comparable on blood MAIT cells in all subjects (figure 3F). We next measured MAIT cell antibacterial cytokine production (IFNγ/TNFα/IL-17) and cytotoxic capabilities (GranzymeB/CD107a/Perforin) in response to E. coli challenge. 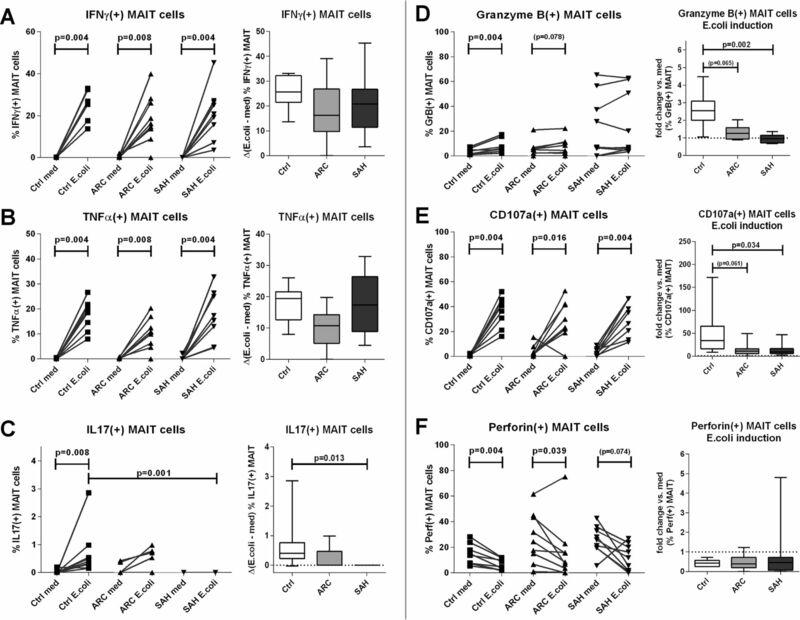 Starting from very low cytokine production in basal/unstimulated conditions (figure 4A–C), E. coli stimulation induced similar levels of MAIT-specific IFNγ and TNFα in all groups (p<0.008) (figure 4A,B), but IL-17-producing MAIT cells were only found in controls: ARC patients had a weaker IL-17 response and this was completely absent in SAH (p=0.013) (figure 4C). 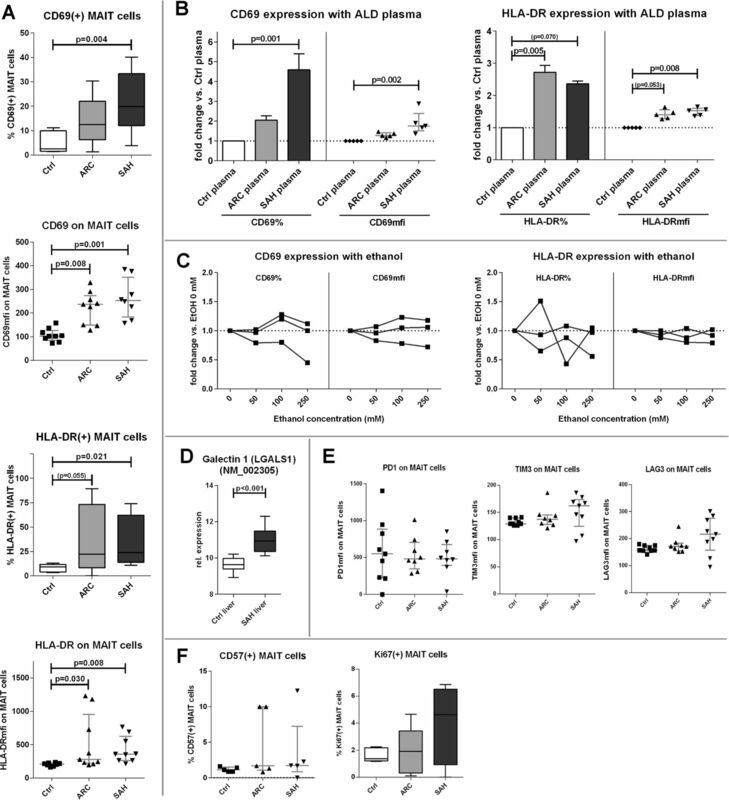 Blood MAIT cells show defective antibacterial cytokine/cytotoxic responses in ALD. (A)–(C) MAIT-specific IFNγ, TNFα and IL-17 responses upon in vitro Escherichia coli stimulation of ALD/control PBMC, absolute frequencies, and Δ-changes versus unstimulated samples. (D)–(F) MAIT cell GranzymeB, CD107a and Perforin responses upon in vitro E. coli stimulation of ALD/control PBMC; absolute frequencies and fold-changes versus unstimulated samples (n=9 for all groups). ALD, alcohol-related liver disease; ARC, alcohol-related cirrhosis; IFN, interferon; IL, interleukin; MAIT, mucosa-associated invariant T cells; PBMC, peripheral blood mononuclear cells; SAH, severe alcoholic hepatitis; TNF, tumour necrosis factor. With regards to cytotoxic potential, MAIT cells from all three groups expressed quantifiable basal levels of GranzymeB, CD107a and Perforin, which were marginally greater in ALD patients (both ARC and SAH) than controls (figure 4D–F). Upon E. coli challenge, GranzymeB(+) MAIT cells increased significantly only in controls (p=0.004). GranzymeB induction was weaker in ARC (p=0.065) and virtually absent in SAH (p=0.002) compared with controls (figure 4D). The magnitude of GranzymeB responses correlated directly with blood MAIT cell frequencies (ρ=0.673, p<0.001) and inversely with MAIT cell expression of activation markers overall (MAIT/CD69_MFI: ρ=−0.426, p=0.048; MAIT/HLA-DR%: ρ=−0.558, p=0.007; MAIT/HLA-DR_MFI: ρ=−0.523, p=0.012). E. coli-responsive CD107a(+) MAIT cells increased significantly in all subjects (p<0.016), but the magnitude of this induction was reduced in both ARC (p=0.061) and SAH (p=0.034) compared with controls (figure 4E). Perforin(+) MAIT cells changed comparably in all subjects in response to E. coli (figure 4F). In few patients with SAH, we observed a possible trend for a correlation between E. coli-stimulated cytotoxic potential of MAIT cells and increased plasma markers of bacterial translocation (CD107a induction vs D-lactate in SAH: r=0.985, p=0.015). 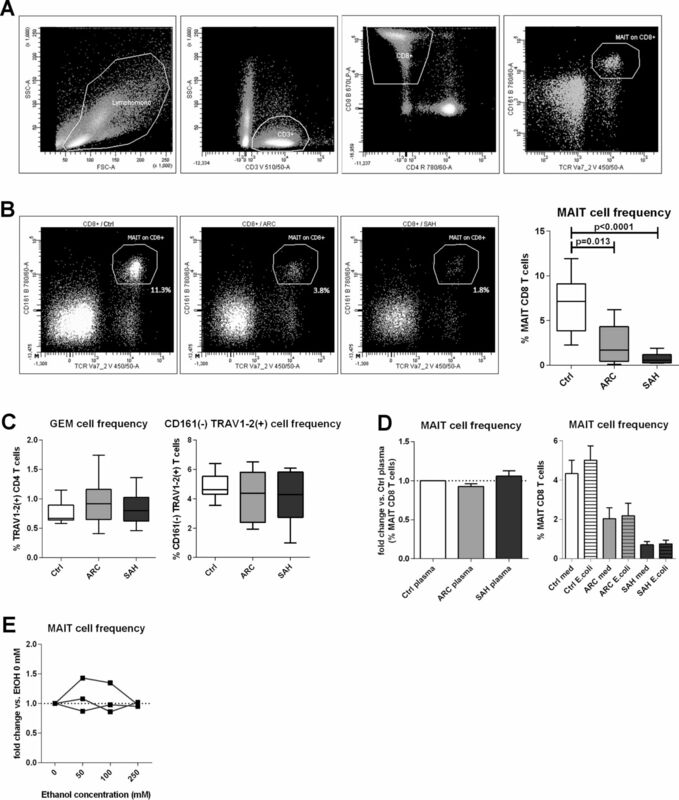 Innate-like features and functions by MAIT cells require the expression of transcription factors RORC/RORγt, ZBTB16/PLZF, Eomes and T-bet. We found that expression of RORC/RORγt and ZBTB16/PLZF was weaker (MFI) and rarer (% frequency) in blood MAIT cells from patients with ALD, particularly in SAH (p<0.006) (figures 5A and online supplementary figure 4). MAIT cells from SAH also expressed less Eomes and T-bet, although not significantly (online supplementary figures 4–5). These results paralleled the dramatic depletion of blood MAIT cells and the functional defects (IL-17/GranzymeB/CD107a) observed in the remaining blood MAIT cells in patients with ARC/SAH. Notably, microarray data from SAH liver tissue also showed similar features as those observed in blood MAIT cells, with reduction of RORC/RORγt (p<0.001), ZBTB16/PLZF (p=0.039) and also Eomes (p<0.001) compared with healthy liver tissue (figure 5B). Defective expression of innate-like/type-17 transcription factors by blood MAIT cells and intrahepatically in ALD. 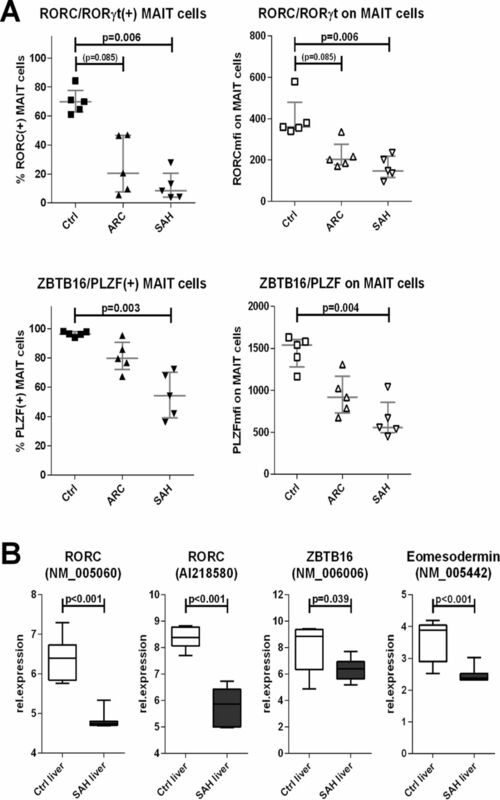 (A) Blood MAIT cells from ALD display reduced expression of RORC and PLZF compared with controls (n=5 for all groups). (B) SAH liver tissue (n=15) underexpresses RORC, PLZF and Eomesodermin compared with healthy liver tissue (n=7). ALD, alcohol-related liver disease; ARC, alcohol-related cirrhosis; MAIT, mucosa-associated invariant T cells; SAH, severe alcoholic hepatitis. Plasma endotoxin and D-lactate were elevated in our patients with ALD, confirming increased intestinal permeability and endotoxemia in these groups (online supplementary figure 1). To test the impact of increased bacterial translocation on MAIT cells, we treated control PBMC with FEB from ALD patients and controls and measured MAIT cell frequency, phenotype and function in basal and E. coli-stimulated samples. Exposure to FEB from ALD stool extracts induced MAIT cell depletion compared with untreated samples (p<0.001) and also compared with HC stools (p<0.025) (figure 6A). This depletion was specific for MAIT cells, as total CD8(+) and total CD3(+) cells were not reduced upon exposure (online supplementary figure 6). Functional apoptosis measured by caspase activation in MAIT cells was always minimal and comparably low in in all stool groups and medium alone (figure 6A). Contact between healthy PBMC and faecal extracts of bacterial antigens, toxins and metabolites (FEB) from ALD patients and controls causes quantitative and functional impairments of MAIT. (A) FEB-induced MAIT cell depletion. Apoptosis rates are not different between the groups, illustrating that FEB-induced MAIT cell depletion is apoptosis independent. Control stools: n=12; ARC stools: n=20; SAH stools: n=7. The bar plot represents mean±SD. The black bars represent % of apoptotic VybrantFAM(+) MAIT cells; the white/shaded bars represent MAIT cell frequencies; both quantities are measured on the total CD8 T cell population, as described in ‘Materials and Methods’. (B) FEB-induced hyperactivated state on MAIT, CD69/HLA-DR. (C) FEB-induced immunoinhibitory checkpoint upregulation, PD1/TIM3/LAG3. FEB-induced suppression of MAIT cell antibacterial cytokine (D) and cytotoxic (E) responses; zebra bars represent Escherichia coli-stimulated results. In panels B–E, control stools: n=8; ARC stools: n=18; SAH stools: n=5. ALD, alcohol-related liver disease; ARC, alcohol-related cirrhosis; MAIT, mucosa-associated invariant T cells; PMBC, peripheral blood mononuclear cells; SAH, severe alcoholic hepatitis. Expression of MAIT cell activation markers CD69 and HLA-DR was approximately 1.5-fold stronger and more frequent in samples treated with FEB compared with medium alone (p<0.016) (figure 6B). Compared with controls, induction of CD69 was weaker with FEB from patients with ALD but HLA-DR induction was stronger (figure 6B). Exposure to FEB also suppressed MAIT cell antibacterial cytokine responses: E. coli-responsive MAIT cells producing IFNγ, TNFα or IL-17 were less frequent with ARC or SAH extracts (but not control) (p<0.012) (figure 6C). FEB also had a significant impact on the cytotoxic capacity of MAIT cells, with 50% reduction of GranzymeB(+) MAIT cell frequency (p<0.008) and 30%–60% drop in intracellular granule content (MFI) (p<0.008). This effect was stronger with SAH extracts (figure 6D). Perforin content was also reduced by approximately 10% in healthy MAIT cells upon FEB exposure (p<0.01) (figure 6D), while CD107a expression and responses to E. coli were unaffected by FEB (figure 6D). Our work describes for the first time the characterisation of MAIT cell dysfunctions in the immunopathogenesis of ALD. We reveal a broad spectrum of dramatic quantitative and functional impairments, both in patients with ARC and particularly in those with SAH, possibly signifying an association with disease severity. Several other mechanisms could also have been responsible for the observed MAIT cell depletion during ALD, including direct ethanol toxicity or loss of detection due to activation-related CD161 downregulation.41 We excluded these hypotheses experimentally and our data suggest that MAIT cell depletion is a direct consequence of contact with gut bacteria, bacterial antigens and metabolites due to loss of gut integrity and increased gut permeability as likelier pathogenic mechanisms, possibly through activation-induced cell death.42 Our investigation excludes caspase-dependent apoptosis as the driving cause of MAIT cell loss in our study and we believe that other pathways of both programmed and accidental caspase-independent cell death may be at play such as autophagy, necroptosis, pyroptosis or necrosis.43 The processes by which MAIT cells die have not been fully elucidated in the literature and this does require more in-depth investigations. We found that intrahepatic MAIT cells in ALD were not deleted, in spite of blood MAIT cell depletion. Moreover, beta7-integrins and chemoattractant CXCL10 were increased in SAH liver tissue compared with controls, suggesting stronger T cell recruitment potential in these patients. Intrahepatic MAIT cells showed preferential portal accumulation, and we also observed that SAH liver tissue strongly expressed MR1 compared with controls, suggesting greater potential of MAIT cell TCR engagement in these patients. MAIT cell preservation in peripheral tissues despite blood depletion has been previously described,8 23 42 46 and Jeffery et al 8 showed that intrahepatic MAIT cells express more gut homing beta7-integrins and CXCR3 than blood MAIT cells and more CXCR3 in patients compared with controls. Liver and gut acquire similar homing receptor profiles in pathological conditions,47 possibly allowing redistribution of immunocytes including MAIT cells during pathological inflammation following gradients of physiological chemoattractants such as CXCL10, which are upregulated in many types of inflammation and in chronic liver diseases regardless of aetiology.48 49 We believe that several cell subsets are recruited to the inflamed liver in patients with ALD, that MAIT cells may participate to this same enterohepatic recirculation and that consequently they can be at least numerically maintained in ALD livers although being deleted in the peripheral blood. MAIT cell portal accumulation has been suggested as indicative of their key role as biliary firewall protecting the epithelial lining from translocated bacteria,8 and the observed MR1 upregulation would seem to further support this, as it is known to occur upon bacterial uptake,16 which is likely increased in patients with increased gut permeability. 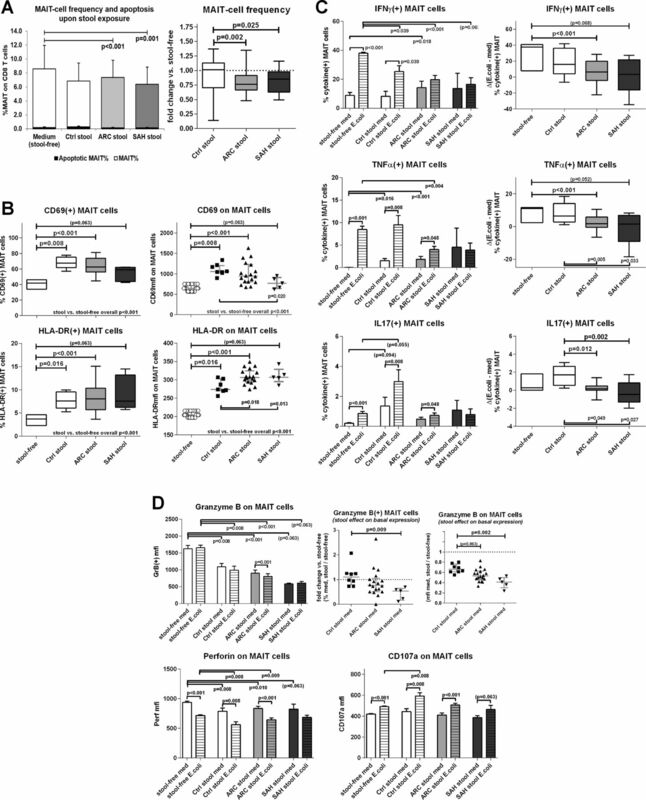 Intrahepatic MAIT cell preservation and increased MR1 expression in ALD livers may also favour intensified MAIT-mediated tissue damage, as MAIT cells can kill MR1-expressing cells.8 11 20–24 Notably, not only did we observe higher basal expression of MAIT cell cytotoxicity markers in ALD than controls, but among ALD patients we also observed a small trend for stronger bacteria-induced MAIT cell cytotoxicity in those with increased plasma markers of bacterial translocation. Microarray dataset results are generally not limited to a single cell type only but extend to the investigated tissue/organ as a whole. For this reason, we believe that further studies are required to clarify the migration patterns and expression of homing receptors on blood, gut and liver MAIT cells specifically, in the context of alcoholic liver disease. Transcription factors including RORγt, PLZF, Eomes and T-bet are strongly expressed in healthy MAIT cells51 and drive the acquisition of their innate-like/type-17 functional features, including mucosal and liver homing.52–55 The loss of antibacterial activity in our patients was found to be associated with loss of these transcription factors (RORγt and PLZF). Analogous findings were reported in HIV,51 and we hypothesise various mechanisms for this dysfunctional profile in ALD. First, it is known that in vitro long-term bacterial stimulation can suppress MAIT cell expression of RORγt and PLZF,51 suggesting that strong/chronic exposure to microbial antigens in pathological conditions in vivo could be responsible for this phenomenon, driving MAIT cells into ‘poised/stunted’ activation. This corresponds to our observations in ALD, which were always more pronounced in patients with more severe disease, where plasma concentrations of markers of bacterial translocation and dissemination were higher. Lastly, it is known that adult MAIT cells are partially unresponsive to TCR-dependent stimulation without secondary cytokine signals, thus undergoing ‘poised’ functional activation.56 One of the most potent MAIT-stimulating cytokines, IL-7, induced MAIT cell functional restoration in HIV,51 reactivating MAIT cell proliferation and cytokine production, including IL-17.14 51 IL-7 is relevant to liver disease, being one of the first and strongest cytokines produced by hepatocytes during liver inflammation.57 However, in our study, blood MAIT cells expressed IL-7R (CD127) regardless of disease status, suggesting IL-7 as potential novel immunotherapeutic target for MAIT cell functional rescue in ALD. IL-15 is also known to enhance MAIT cell activity, although less powerfully.56 58 59 Whether this difference may be therapeutically advantageous requires further study, but reprogramming MAIT cells with IL-15 could boost their antibacterial activities while potentially avoiding maximal activation and overwhelming MAIT-mediated tissue damage. In our study, patients with SAH had the strongest MAIT cell loss and dysfunction and a greater frequency of acquired bacterial infection compared with ARC. The susceptibility to bacterial infection in our patients was also potentially underestimated, as most SAH were treated prophylactically with antibiotics on hospital admission and recruitment. This association is also supported by studies from Grimaldi et al 7, who show that propensity to bacterial infections is inversely correlated to MAIT cell counts. We believe that MAIT cell defects may be important for the susceptibility to infection observed in ALD, responsible for increased morbidity and mortality in these patients.2 3 Furthermore, we believe that MAIT cells provide an important link to the intestinal immunity, which has to date remained elusive in this disease. The state of immunoparesis characteristic of patients with ALD, especially patients with SAH, may be intensified by the combination of quantitative MAIT cell depletion and functional defects associated with the residual MAIT cell population. Ex vivo functionally reprogrammed MAIT cells,14 51 MAIT cells derived from induced pluripotent stem cells (iPSC-derived MAIT cells)60 and strategies aimed at restoring the gut barrier may represent novel attractive immunotherapeutic avenues for cirrhosis and alcoholic liver disease.
. Mucosal-associated invariant T cells in clinical diseases. Asian Pac J Allergy Immunol 2016;34:3–10. Contributors AR: study design, experimental work, data acquisition and analysis, manuscript preparation. SC: study design and supervision, manuscript preparation and final approval. Experimental collaborators: AK, HCJ, PK and YO. Provision of samples: VinP, SA, JAW, ST, GW, JMR, DS, AE, AF, JSB, KM, CL, VisP, TH, SP, MS and KK. Critical evaluation of the manuscript for important intellectual content and study funding: RW. All authors reviewed and approved the final version of the manuscript. Funding This study was funded by the Foundation for Liver Research. Ethics approval All local recruiting centres had individual ethical approval: the North East London Research Ethics Committee (08/H0702/52); the National Research Ethics Service (NRES) Committees South West (13/SW/0219), Portsmouth South Central (12/SC/0359), London Riverside (135979), London Westminster (12/LO/1417); the Local Research Ethics Committee (LREC) South Birmingham (98/CA5192 and 06/Q2708/11); the Steroids or Pentoxifylline for Alcoholic Hepatitis trial (STOPAH) (09/MRE09/59); and the Richmond VA Medical Center IRB (bajaj004).